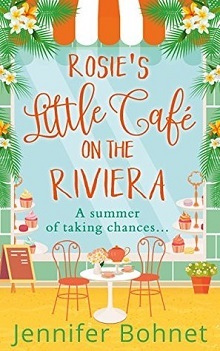 Rosie has finally jumped into the deep end, after working and saving her money, she’s decided to take her dream of opening a café on the French Riviera to fruition, and with her best-friend and former sous from her private yacht cheffing gig, she has done it: bought a small waterfront space, ready to make her mark. Arriving before the ‘high season’ there is tons of clean up, menus, planning and new people to meet. Seb, the guy who is oh so friendly but looks aimless and possibly homeless, Erica the woman with a young daughter who runs a shop down the street but who carries a sadness with her, and the polished, driven and businesslike realtor Gee Gee, best friend to Erica and regular customer at the café with her laptop and mobile close to hand. Rosie is struggling and trying to work in her budget, she and Tansy are trying everything: extra hours, menu variations, and while initially appearing to be well received, nothing is ever that simple. From Rosie’s own rather vigilant anti-man stance and her lingering hurt from her last break up, to the realization that Seb is a well-regarded Michelin-starred chef and owner of the hotel next door, some reappearances from her ex, and a bit of double-play with a very necessary yet rather mysterious staff member, the story weaves us through the lives of the major characters, and does so in ways that are revealing and unexpected. From the first interaction to the last, Rosie and Seb’s relationship was easy, easy to see her innate friendliness and attraction, easy to see why Seb would want to help, offering advice and trying slowly to allow her to move forward. In fact, this really becomes a story, redolent with the charms of a small French seaside town, as it works its magic to bring healing, hope and new beginnings to all of the players. From Erica’s moving forward from her husband’s tragic death and seeing her child regaining some of her own joy in life, to GeeGee’s reframing her own career and life to take charge and stay in the area, and Rosie’s ability to make amends with her long-absent father, as well as an honest, adult conversation with her mother, the story has plenty to keep readers engaged and intrigued. Immersive and complete in just these pages, this story packs plenty of punch all while never crossing the line into tension filled or overly angsty. The perfect ‘pick you up’ read, as everyone finds growth, redemption and a new outlook within these pages. Thank you so much for this. I’m so pleased you enjoyed ‘Rosie’.